DIY for a fashion friend. Hello! This summer DIY is super quick and a fun one to do... it shouldn't take you more than 30 minutes! I LOVE floral sunglasses and think they are so fun, you can also apply the same concept to create a more bling-bling bejeweled pair - The options are endless really! 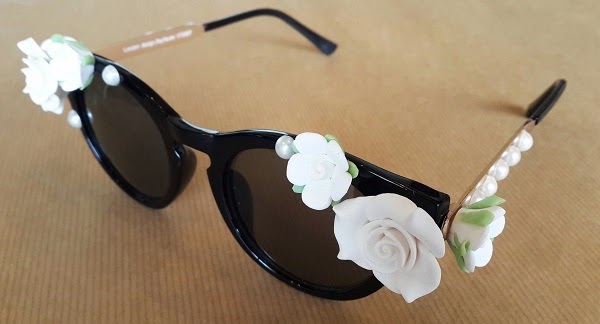 Glue the plastic flowers onto your sunglasses using the super glue. Use the pin to push them around if you misplace them first time round. Be very careful with your superglue (I once glued my finger to my lip). Top Tip: If you can't find plastic flowers buy cake decorating ones and paint them with clear nail polish so they don't melt away. Glue jewels onto the arms of your glasses as well as the frames. Use the pin to help you move the jewels into place.. this will help you avoid getting glue on your fingers. Top Tip: With superglue less is more. Finished yay! Don't forget lotss of selfies with these on!